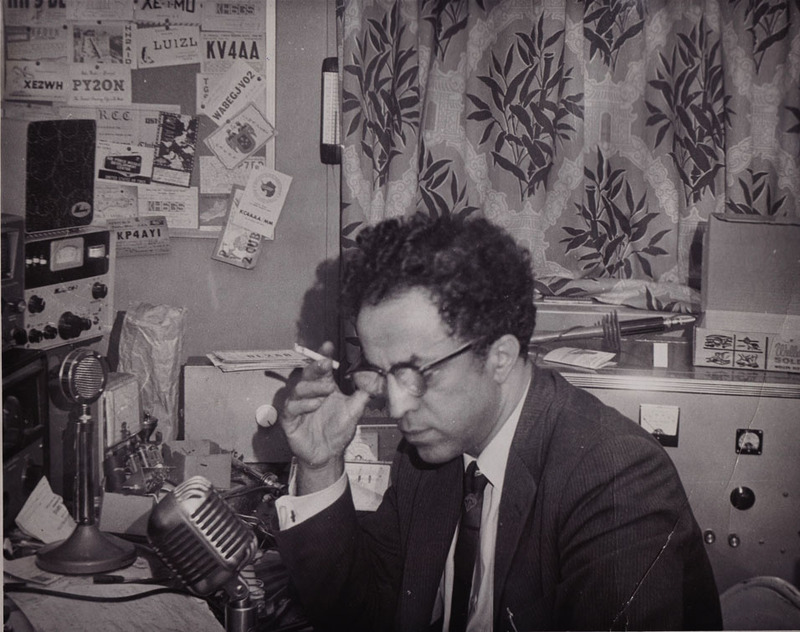 My uncle Louis Cleage with his ham radio and his ever present cigarette. For many years my uncle Louis communicated with ham operators throughout the world using his short wave radio. In this photograph he is in the sun room that ran across the back of the family home st 2270 Atkinson in Detroit. 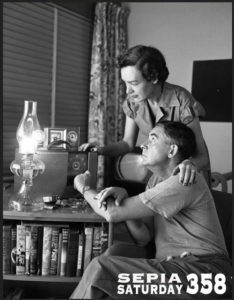 Later the radio was moved down to a room in the basement. I do not remember hearing him talk or receive messages, but I seem to hear his voice giving his call letters W8AFM – W 8 Able Fox Mary. At one point we talked about learning the Morris Code so we could get licensed as ham radio operators, but we never did. For other Sepia Saturday, click. Great photo! The microphone and items on the bulletin board provide tantalizing hints about what your uncle was like. And that is not even the half of it! He looks dressed up. I thought ham radio was a hobby. No? Louis, as I remember always wore a suit, except when he was at his cottage in Idlewild, MI. Yes, it was a hobby. In his work life he was a family doctor. How exciting to be a radio ham; and once again you have matched the prompt so well. What a lovely portrait of your uncle and an excellent match for this week ‘s prompt. goodbye. ” My father was always sitting nearby, but we held a conversation . This kept us in touch until we saw each other. I’ll never forget his call letters..K5FGH. The details around the desk really turn your keepsake photo into a rare cultural artifact from the era of the Ham Radio Operator. My dad always wanted to join that world but he never mastered the code. On the board are Radio Call Sign postcards that are still collectible. I encounter them on eBay when searching for “radio band”. They were used to measure the distance of signal transmission and reception. I agree, the study of your uncle with his radio is a perfect match. We once bought a house and discovered after hearing noises at night that there were possums in the cavity brick walls. The previous owner was a ham radio enthusiast and we worked out that the possums’ point of entry was a sizable hole in the wall left behind when his aerial mast had been removed. We blocked that up but of course the desperate creatures then sought alternative ways of getting inside, including coming down the chimney on one memorable occasion. That sounds horrible! I cannot imagine a possum coming down my chimney! Great match! So good to see a photo of a HAM operator. I was always in awe of them, and that there was a network kind of like an underground, going all over the world.